I’m already regretting my decision to bivy at the base of the Devil’s Bedstead and I haven’t even fallen asleep. While the freezing temperatures ease my concerns about skiing in the morning, the temps aren’t doing a whole lot for my current sleeping situation. 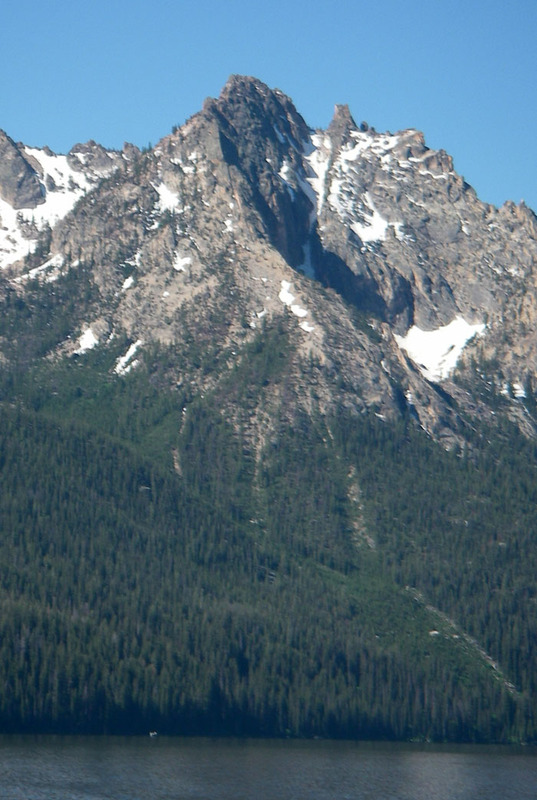 Located in the Pioneer Mountains, the Devil’s Bedstead rises roughly 4,800’ from the valley floor and is defined by a 2,800’ face that looms over the Kane Creek drainage. Despite the cold temperatures, I manage to sleep until just after 3am. With a rather leisurly start to the day, we begin the bushwhack to the base of the mountain just after five. The route up the Bedstead is pretty straightforward, with the exception of gaining the basin at the bottom of the face. For anyone trying to replicate this here’s the key: go several hundred yards pass the drainage that, on the map, gives access to the basin (there’s a faint trail). At this point start heading up, through steep, yet open forests. Going directly up the drainage is possible, but it’s steep, heavily wooded, and pretty much fubar. Scrambling through the loose rock and dirt, we eventually make it to the subtle basin below the daunting face. Any concerns about the snow setting up are immediately dismissed once we reach snowline. 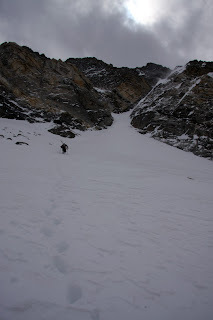 The snow froze, and it froze deep, allowing for a long, but essentially straightforward route up the face. As we gain elevation, our crampons and ice axes provide less and less purchase, and I can’t help but think how good an idea not falling is. After a scramble over a windswept scree field, we eventually reach the summit, just as we think the snow is beginning to warm. Relaxing on the summit, we predict that the snow should be turning to corn in the next hour, considering the face has been catching light since six thirty. When it comes to skiing (and most other things I suppose) I have the patience of a virgin on prom night, which is probably not the best quality given our current situation. So, after a casual lunch on the summit, I deemed the snow had reached sufficient softness and it was time to drop in. Wrong. The first mid radius turn I ambitiously made was nothing short of terrifying- I thought the teeth were going to chatter out of my jaw. Time to safety ski again…super. Luckily, midway down the face the snow began to soften and we got some of the steep, spring turns we came for. In retrospect, it’d be extremely difficult, if not impossible, to get the entire 4,000’+ descent in good condition. Had we waited for the top to corn up, I think we’d be in real trouble at the bottom- both in terms of snow quality and stability. I think in this case, being impatient wasn’t the worst thing. I poached the above pic off the Lech-Zurs website, it’s from this afternoon. So, maybe it’s not epic, mid winter conditions, but I’m sure some of the other areas with glaciers should have the goods. 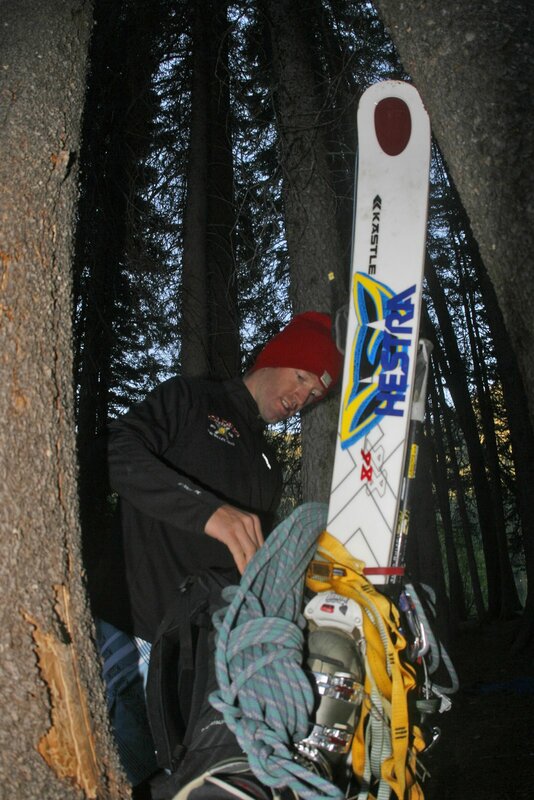 I’m over here testing some new skis and working with the guys at Kastle, the brand sewn into the fabric of the Arlberg. For those of you who don’t know the about the Arlberg, it’s one of the places that modern skiing was born. I’m not talking about the fat ski revolution either. I’m talking born as in when people started using skis for recreational purposes, not just transportation, at the turn of the 20th century. If you want to go to a place where people truly breathe skiing, go to the Arlberg, it’s amazing. For once, it appears, I have brought the snow somewhere. I’m the guy that usually shows up to, “oh, man, you should have been here this morning/yesterday/last week, it was really good then.” But alas, the day I touched down in Austria winter struck and dumped over a meter of snow in parts of the country. And guess who’s here to shred it? As much as I’ll miss shredding the ribbon of death at A-Basin and Loveland, I think I’ll stick with the real stuff. 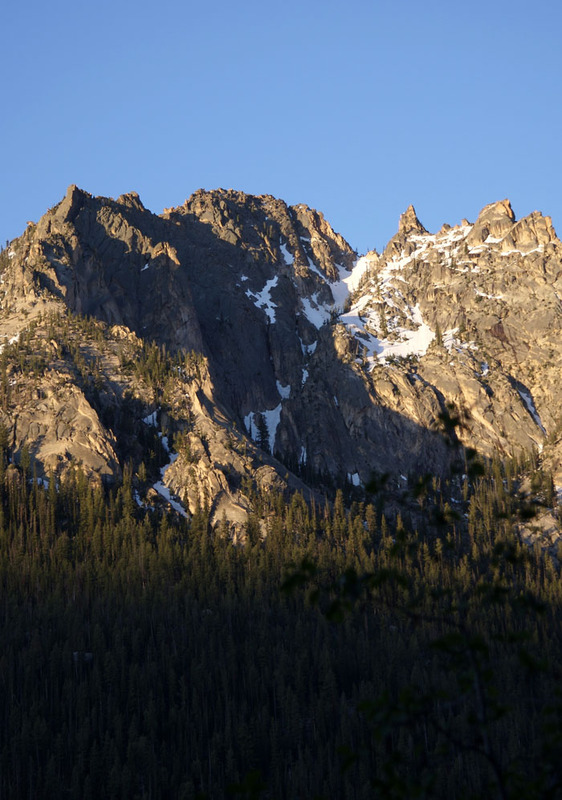 With spring temperatures and fresh snow into June and for those willing to slog a little further, summer is merely an option in the Sawtooths. While most of the Custer County population was content drinking PBRs on the lake, we had our eyes set on the remaining snow in the Chockstone Couloir at the northwest end of Redfish Lake. The Chockstone Couloir, or the Boy Scout Couloir as it is known locally, prominently divides the Grand Mogul, which overshadows Redfish Lake and serves as the backdrop for countless family photos throughout the summer. 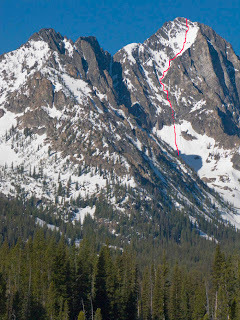 Besides the roughly 1,000 vertical feet and 40-50-degree pitch of the couloir, it is distinguished by a large piece of granite lodged in the middle of the route. This chockstone is the crux of the route on the way up, offering a 5.5 pitch of rock and ice depending on the time of year. On the way down, it’s either a sizable, must-land mandatory, or a section of rapelling depending on how ambitious one’s feeling. 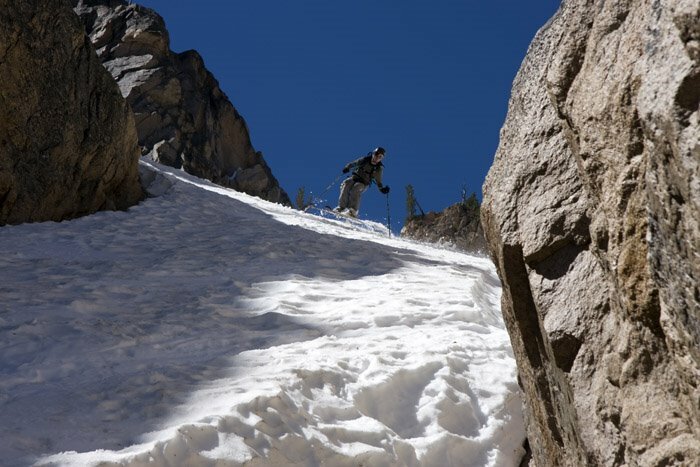 Either way, the route offers a challenging snow climb and rewarding ski descent well into summer. Up at first light, we began the approach as our campmates-other skiers from the Sun Valley area-were considering calling it a night. The hour and a half bushwhack and scramble across scree fields to get to the snow and loaded down with ski and climbing gear, served as an appropriate warm up for the climb. 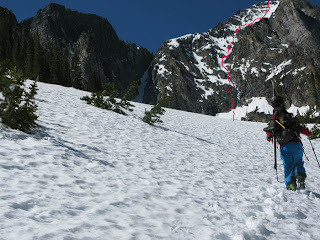 Gearing up at the bottom of the snowfield, a big-block engine size piece of rock released from the top of the couloir and cartwheeled to our position at the bottom sending us running. The incident provided the necessary motivation to gain the protection of the chockstone as quickly as we could. As the lower half of the climb is particularly walled-in, one can’t help but feel somewhat vulnerable. From the chockstone, Bryce led and set several pieces of protection through the zone of loose rock, rotten snow, and generally untrustworthy conditions. Feeling exposed while climbing the crux, we both scrambled through as quickly as we could to the general safety of the snow above. With a somewhat faded sense of urgency after the crux, we completed the roughly five pitches to the top at a more leisurely pace, summiting just as the snow was beginning to turn. The sense of accomplishment that could be expected was somewhat absent at the summit. Instead it was replaced by an unspoken anxiety about dropping into a no-fall zone for our first turns in several months, hoping the gnar switch still worked. 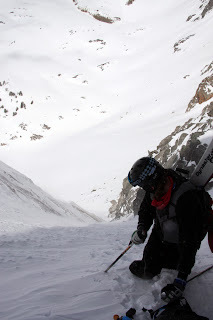 Luckily it did, and the steep turns at the top of the couloir lent themselves to April skiing rather than July skiing. While there was big talk-mostly by me-at the campfire the previous evening about sending the mandatory chockstone section, on the way up we deemed that it would be reckless, stupid, and virtually impossible to stick Confident with my rapelling abilities, I chose not to put my crampons back on. I can now attest to the fact that in ski boots, on smooth, wet granite, one has little control over the direction that he or she rappels, and is mostly at the mercy of gravity. After I had clumsily reached the bottom of the pitch and Bryce rapelled, we continued down the lower, more sun-baked, section of the route. Skiing as far as we could on what was quickly becoming less and less skiable snow, we reluctantly swapped our gear when we realized we’d exhausted the snow. Within two hours of reaching the summit we were back at our camp to greet our awakening campmates. While sitting on the lake and drinking PBRs may have not sounded too good to them at that particular hour, it sure sounded great to us. The top is a good place, be it ideological or physical. In our case, as we sat on top of the chute that ran across Cobb Peak’s north face, it was particularly good, for several reasons. First off, we are skiers and as such are permitted to celebrate the achievement of a goal, regardless of it only being halfway accomplished. Like a hockey team celebrating in the second intermission or a baseball team celebrating during the seventh inning stretch, we sat there grinning, snacking, and congratulating one another on a job well done. To us however, this was more of a celebration of the entire season. After a couple of tough weeks in the freeskier world, it was safe to say that we were both simply happy to be there, about to embrace some of the last turns of the season. I’m a firm believer that it’s crucial to have that one last good day toward the end of the year, as this ultimately dictates the enthusiasm someone brings to the next season. Reflecting on our approach that took an impressively inefficient five hours, we gazed around and took in winter one last time. Snow was absent from many of the surrounding hills, with entire drainages looking brown- abandoned by winter but not yet embraced by spring. As a skier I hate moments like this. I can’t help but feel a combination of loss and nostalgia. 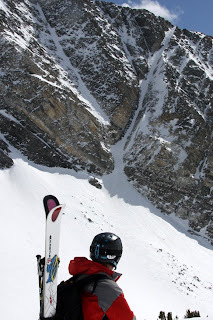 Turning my attention back to the chute, these feelings were replaced by excitement and anxiety as I began to examine what we were about to ski, and thought about how much I love moments like this. 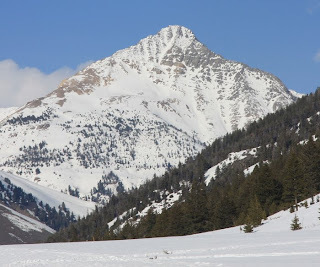 At 11,650’ Cobb sits at the South end of the Pioneer Mountains and, because of its southern location, is one of the most prominent peaks in the range. 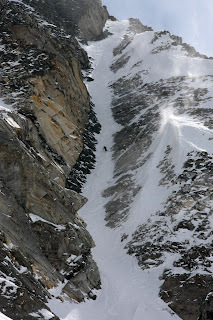 The North face is largely unskiable except for a steep, narrow chute that runs slightly east to west. While the snow was by no means exceptional, it would serve as a means to an end. It provided an unforgettable last day- making the inevitable arrival of summer a little easier to handle. After a month and a half of intense competition, empty miles on the road, and countless Coronas it was time to, well, ski some more. 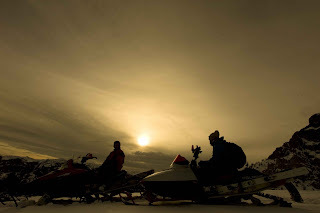 As the hangover from Crested Butte ebbed, we loaded up the sleds and headed north, home to Idaho to tap into zones in the Sawtooth National Forrest that had been beckoning for years. Although conditions were by no means ideal, we were willing to sacrifice powder for snow stability and the accessibility that the hardpacked conditions granted. Fittingly, and in the spirit of competition, we were once again faced with making the best of the conditions in the time that was allotted. After several days of scouting we had a zone lined up that would deliver the goods- long, steep, and exposed lines that had a rather simple shuttle up the back side. With a bluebird forecast for the next day we avoided the highly anticipated Sun Valley Suns- Jackson Hole Moose hockey game and prepared to catch the sunrise. We pulled out at 5:30am, stoked and geared up, when we heard the sound that will spoil any day- the “thump, thump, thump, thump” of a flat tire on the trailer. After cursing and undoubtedly waking up several neighbors, we were attacking the situation with ruthless efficiency that would make pit crews jealous. After all, the sunrise doesn’t wait. Staging as fast as we could, we began racing out to the zone as the pink alpenglow was brilliantly lighting up the peaks we were supposed to already be on top of- we were officially blowing it. We arrived at the zone and quickly went to work organizing shuttles and taking advantage of the light that, although fleeting, was still amazing. Over the next several hours we skied all the lines the zone had to offer and left content, at least for the day. We’d try several other times before we had to leave, getting skunked each time by snow, light, or whatever else could go wrong. 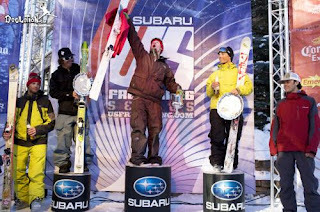 Much like competing, conditions were not necessarily ideal and nothing went as planned, however, after years of competing we’d likely be lost if anything did go as we’d imagined.